The Infertility Overachievers: The Girls Have Arrived! 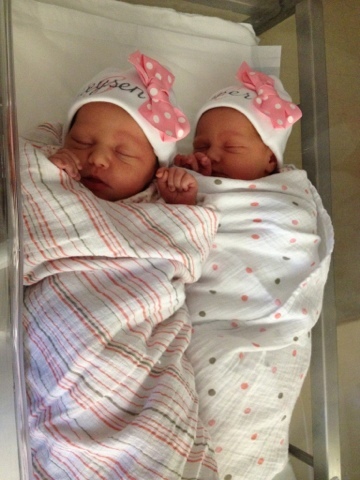 Greysen Elizabeth and Harper Elliot arrived yesterday weighing in at 5lbs11oz and 5lbs8oz respectively. To say it was a traumatic delivery would be an understatement. Greysen arrived quickly and easily via vaginal delivery, Harper however had her own plans. She flipped transverse and tried coming out sideways (left arm and left leg first) the dr had to shove her back in and the try to flip her. I'm not exaggeration when I say the Dr was elbow deep in me for about 10 minutes. Finally they knocked me out and gave me an emergency csection to get Harper out. We are all doing really well,but I'm in ALOT of pain. The girls have done great and did not have to go to the nicu. They are so cute and look just like each other. If they have the same blood type, we are going to have them tested to see if they are identical. They look just like London, and even have his red hair! Congratulations!!! I'm so glad they are healthy and they are 100% adorable! Wishing you a smooth recovery! Congrats again! They are stunning! Sorry to hear about the rough delivery, I'm sure Mike is being awesome though taking care of you! We love you guys!! Congrats my friend, they are beautiful! Congratulations Aly! They're absolutely beautiful. I hope everything goes smoothly for you guys. Wow! What a story! I hope you're able to take it easy and let yourself heal, both physically and emotionally. They are gorgeous! Congratulations, they are lovely. Hope you start feeling better soon, hugs. Congrats! Your one of the lucky ones like myself that got to experience delivering twins vaginally and by c- section! CONGRATULATIONS! They're beautiful! I'm sorry for the traumatic delivery. I hope your recovery is quick! Congratulations!!!!! They are just beautiful! CONGRATS!!!! I'm so glad they are here and everyone is safe and healthy...sorry about the double delivery, one of each way....Hope your pain is controlled soon and you get to enjoy your little girls. Hope the boys are loving being big brothers :) They are gorgeous! They are just beautiful!!! I'm glad that everything is okay and everyone is here safely. But wow, what a difficult delivery! I have a very vivid image of my OB with his arm in up to the elbow, ouchie!!!! I hope you can get some extra help and heal quickly. Congratulations!!!! They are lovely! I had to be knocked out during my Csection too. Hope you have a smooth recovery. They are gorgeous! So happy for you... Hope you have a speedy recovery! CONGRATULATIONS!!!! This is such wonderful news!! ...well, not the traumatic delivery part but the fact that the girls are here safe, sound and healthy!! Good work Mama! They are so adorable!! I am so sorry about your trumatic delivery :( But look at thoses little angel girls! Congrats again to your whole family! Beautiful! So glad everyone is healthy and happy, despite your double-whammy delivery. PERFECTLY beautiful!!!! Congrats on you little blessings! Enjoy! So excited for you. They are beautiful! Oh wow - I was reading through the PAIL blogroll in my reader and came across this and just had to say (1) CONGRATS!, and (2) WOW. Crazy girlies! So glad the doc was able to get Harper out okay, though maybe not in the way you originally had intended. Best of luck in the recovery process. Congratulations!! Your daughters are beautiful!! Congratulations on your big healthy girls! Sorry to hear the delivery was awful. But you got two healthy babies + one healthy mom, so that's a win in my book. YAYYYYY they are beautiful. Congrats!! congrats - they are ADORABLE! You've performed an impressive task and our whole community will be thankful to you.